Next Thursday the Atlanta Braves will begin another marathon baseball season with aims of winning a World Series. Oddsmakers give them a 22 to 1 chance to accomplish this feat. 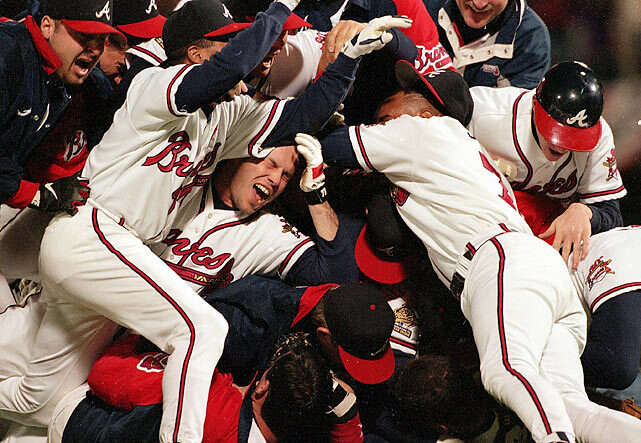 The Atlanta Braves celebrate winning their only World Series championship in 1995. Even with unprecedented regular season success, championships have eluded the Braves. Whether or not they actually succeed really isn’t the point. I’ve been a Braves’ fan since 1982 when my Aunt Phyllis took me and my brother, Lee, to our first Braves game during a vacation visit from Texas. The Braves have won the World Series exactly once since 1982. For all their success in the 1990s and early 2000s, winning 14 division titles and one World Series, it still comes down to championships. By that measure, the Braves have been a disappointment. Who can forget the meltdown that ended last season? Cruising into the playoffs, the Braves blew a 10-game lead allowing the Cardinals to get into the post season and win the World Series. It was agonizing to watch the Braves’ hopes die on that last Wednesday of the season. Disappointment: That’s what makes the Atlanta Braves a quintessential Southern team. Southern identity is inevitably linked to the War Between the States, though less now in the New South. Judging by the number of “Second Place Trophies” – those monuments to Southern bravery and fallen heroes that adorn many town squares throughout the South – there is a sense of pride in having fought the battle no matter what the outcome. Southern identity is about fighting, not necessarily winning. You can argue that its more frustrating to fall just short than to be out of it before August, but to me, baseball’s lengthy season, series format for its playoffs and championship and even the grueling 9-inning, often 4-hour plus games all conspire to make winning consistently year after year as rare as a two-headed calf. Braves fans took a lot of abuse around the league toward the end of the run when first round playoff games wouldn’t sell out. We were called “spoiled” and “lackadaisical” and “unsupportive.” But honestly, who wants to be brought to the brink so many times, only to be let down? Having grown up in Texas with a hapless franchise to pull for, I have followed the Rangers from a distance, naming them my “American League team.” Fans of the Rangers have gotten a taste of the Braves fans’ diet. After years of futility, the team has made two straight World Series appearances only to lose them both. They were one out away from winning the World Series last year against St. Louis on two different occasions. That, my friends, is frustrating. Can Chipper rebound from his knee injury to make a meaningful contribution to the team in his final season? While hope springs eternal in major league cities around the country, I have come to appreciate elements of the Braves outside of winning championships. I have followed with interest as the Braves – like the rest of us in this economy – have tried to manage their payroll. 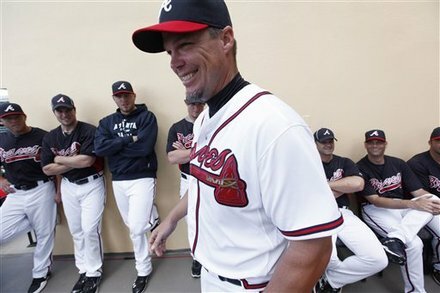 I was intrigued by the way they handled the transition from legendary manager Bobby Cox to Fredi Gonzalez. I enjoy seeing the development of players through their minor league system, watching guys like Craig Kimbrel and Freddie Freeman burst onto the scene. So whether or not the Braves make a World Series run, I will root for them this year. I will follow them as closely as I can, losing track a few times during the season when they make lengthy West Coast road trips, but being entertained by their pursuit of victory for the next seven months. They will have increased competition from the Washington Nationals and Miami Marlins. The Phillies are still the team to beat in the division. There are question marks in the lineup with Chipper’s spring training injury and youth at shortstop. Young arms abound in the starting rotation and bullpen, but whether all the promise materializes remains to be seen. But it will be seen. Millions of people across the South still claim with pride to be Braves fans. Here’s hoping for a fun season, win, lose or rain. Are you a Braves fan? Join the conversation by leaving a comment below telling us why or why not. This entry was posted in Uncategorized and tagged Atlanta Braves, baseball, Bobby Cox, Chipper Jones, contemporary South, Craig Kimbrel, Freddie Freeman, Fredi Gonzalez, Lance Elliott Wallace, Lance Wallace, New South, New South Essays, NewSouth, South, Southern, Southern Culture, Southern Living, Southern sports, Southerners, the South, World Series, World Series odds. Bookmark the permalink. The lasting “southern” image I will have going to Braves games is the tail-gating. Maybe it spills over from SEC football games, but there were a lot of folks sitting in the parking lot drinking before the game. Can’t do that it in Texas. It’s too hot and there are no trees. Braves fans in Atlanta are definitely spoiled. In most other cities with MLB, they won’t play the games on tv if the seats aren’t sold out – or at least close to it. Here, we can watch the games on TBS anytime.